Story collections are hard to review, especially if they don't have a unifying theme. The stories in this collection were selected as the best stories from literary journals and magazines throughout the country and the styles and content of the stories couldn't be more different. The writers range from National Book Award Winner Louise Erdich to relative newcomers like Allison Alsup and Rebecca Hirsch Garcia. The editor, Laura Furman, attempts to ease you into the book by dedicating quite a few pages to the importance of short stories and how the jurors chose the stories. The jury members each discuss their favorite story and their reasoning for its inclusion in this collection. Furman writes about the strengths of short stories and the necessity of publications that publish these works. In addition, she discusses many of the stories in detail, which I found jarring at the beginning of the book. There were several strong stories in this collection. In "Valentine," a teenage girls finds escape from her boring and ordered life when she befriends a fascinating boy. But things don't go quite the way she expected. In this story, writer Tessa Haddler expertly portrays the time period and what it feels like to be a teenager. Stephen Dixon's "Talk" follows a man who has recently lost his wife. As he goes about his day, he realizes that he has not spoken to a single person and his pain and loneliness are apparent with each word. My favorite story was "You Remember the Pin Mill" by David Bradley. He starts each paragraph with "I remember," which should have been infuriating as a narrative device. But it works wonderfully as a man reflects back on his life and on one year in particular. His father is abusive, so he and his mother run away to her childhood home and her father. While things are safer away from the boy's father, there are a whole new set of tensions in a town divided between black and white, rich and poor. Bradley has crafted a beautiful story about the moment in a child's life when they see the failings in the people who they love the best. 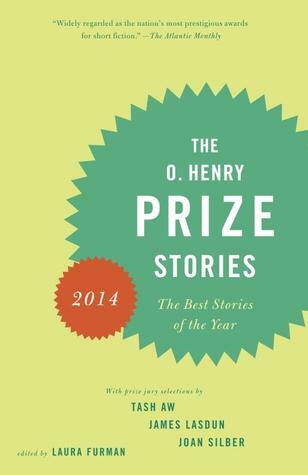 The O. Henry Prize Stories 2014 seems a bit long while reading it. But there are many stories in this book that will take you to distant places and take you on incredible and sorrowful journeys. Reading a collection like this is a great way to break up your reading and find new authors to enjoy. I always have a hard time reviewing short stories too! I'm also a bit hesitant to pick them up because it's highly unusual for me to like every story in a collection. I think it's inevitable that you will like some stories better than others. Reading is so intensely personal and time-sensitive hat I think it very possible to have new favorites when you read a collection years later! I like short stories--either by themselves for reading when I don't have much time, or in a collection by a single author. Which is why it's all the more puzzling to me that I've never picked up a short story anthology to read. Shame on me!